Director of Midwifery, Evelyn Smith explains the significance of the new development and said, “The Maternity Unit of Letterkenny University Hospital caters for approximately 1,700 births every year. While birth of a baby is in the main a very joyous experience for women and their families, sadly there are times when a baby dies before or shortly after birth. “The death of a baby is an incredibly traumatic event leaving parents with overwhelming emotional needs and is one of the most painful experiences that any parent has to face. It signifies the loss of the future, of hopes and dreams and affects the entire extended family. "We hope the room will offer some small comfort to families at this time of great loss. The room has been designed for bereaved parents and their families and I would like to acknowledge the advice we received from parents. The room is private, spacious and soundproof which will allow parents quiet time to spend with their baby and loved ones, while still getting support and assistance from staff. 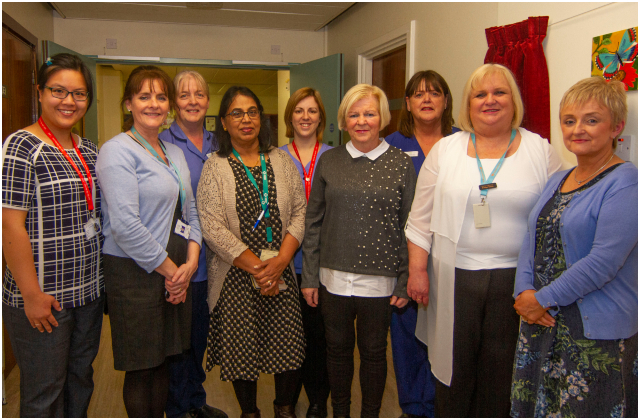 Letterkenny University Hospital staff at the opening of the new bereavement room in the Maternity Unit, from left: Dr Sharon Tay, Registrar; Marion Doogan, Assistant Director of Midwifery; Mary Lynch, Clinical Midwife Manager 2; Dr Sally Phillips, Registrar; Shelley Gillespie, Clinical Midwife Manager 2; Mary Kelly, Health Promotion; Raphael Dalton, Clinical Midwife Manager 2; Evelyn Smith, Director of Midwifery; and Geraldine Hanley, Antenatal Education Co-Ordinator.